Thanks to an apparent loophole in the contract Mayor Rahm Emanuel’s staff signed with the police sergeants union, a sergeant facing a year’s suspension over the handling of the David Koschman case can bypass the Chicago Police Board and have an arbitrator decide his punishment, a judge has ruled. Cook County Circuit Judge Anna Helen Demacopoulos ruled Monday that the contract allows sergeants to have an arbitrator, rather than the police board, rule on any suspension of more than 11 days. The police board, whose members are appointed by the mayor, can not only uphold or dismiss disciplinary action recommended by the police superintendent, but it also can issue a harsher punishment. On Tuesday, an attorney for Sgt. 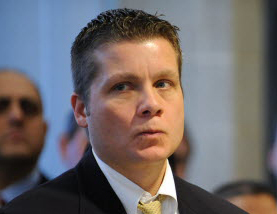 Samuel J. Cirone — one of six Chicago cops who faced firing or suspensions in the botched Koschman investigation — moved to dismiss the police board case. “We don’t believe the board has jurisdiction over this case in light of the court’s ruling yesterday,” attorney Dan Herbert told police board hearing officer Jacqueline Walker on the 13th anniversary of Koschman being punched by former Mayor Richard M. Daley’s nephew Richard J. “R.J.” Vanecko. City Hall attorneys argued that the judge’s ruling doesn’t prevent the police board from deciding Cirone’s appeal of the one-year suspension that former interim Supt. John Escalante recommended in January 2016 over a fabricated police report that had once cleared Daley’s nephew in Koschman’s death. Walker agreed to give the city’s lawyers more time so they can ask Demacopoulos to put her ruling on hold while the city appeals. If that happens, an attorney for the city, Felicia Manno, said she would proceed with the case before the police board. Demacopoulos’ ruling is based on the 2012 contract the Emanuel administration signed with the sergeants union, allowing them to appeal suspensions to either the police board or an arbitrator. Chicago’s rank-and-file police officers and detectives, represented by the Fraternal Order of Police, can appeal suspensions only to the police board, according to the judge’s 13-page ruling. The Emanuel administration disagreed with the judge’s conclusion that sergeants have the right to bypass the police board in appeals of suspensions. “The city of Chicago continues to believe that the Chicago Police Board has jurisdiction in this case and not an arbitrator,” law department spokesman Bill McCaffrey said. “There is no loophole. The contract specifically reads that ‘separation of a sergeant from service and suspensions in excess of 30 days are cognizable only before the police board’ and not by grievance procedures. In January, the U.S. Department of Justice issued a report on the Chicago Police Department that criticized the police board as being part of a historically ineffective system of police discipline. Koschman, 21, of Mount Prospect, and some friends had been drinking on Division Street early on April 25, 2004, when they bumped into a group including Daley’s nephew. After an argument, Vanecko punched Koschman in the face. Koschman fell, cracking his head on the sidewalk, and died 11 days later. Vanecko ran away. He eventually stood in a police lineup, but no one could identify him, so he wasn’t charged for years. A Chicago Sun-Times investigation prompted the police to reopen the case in 2011, but they closed it then without filing charges and included a fabricated witness statement in their final report, which was approved by Cirone. But the Sun-Times’ investigation led to the appointment of a special prosecutor, Dan K. Webb, and Vanecko ended up pleading guilty to involuntary manslaughter on Jan. 31, 2014, and serving two months in jail. Webb said he also considered filing charges against Cirone and five other cops but decided he didn’t have enough evidence to convict them. Emanuel and then-police Supt. Garry McCarthy directed City Hall Inspector General Joseph Ferguson to determine whether the cops should be punished. Escalante, briefly serving as interim superintendent after Emanuel fired McCarthy following the release of the Laquan McDonald police-shooting video, agreed to fire Walsh and Gilger — both retired to avoid punishment. He recommended one-year suspensions for the others. Andrews and Salemme retired. Spanos served his suspension, largely by cashing in about 10 months of vacation days and compensatory time off. Cirone, whose father also was a Chicago cop, filed an appeal with the police board and with arbitrator George Roumell Jr., who decided he had the authority to hear the case.